The Pine Run Retirement Community on Ferry Road is preparing for a multimillion-dollar renovation of its health center, officials announced Monday. Beginning in July, the five floor center, which serves both short-term rehab patients and long-term residents at its Doylestown Township campus, will undergo an extensive overhaul. 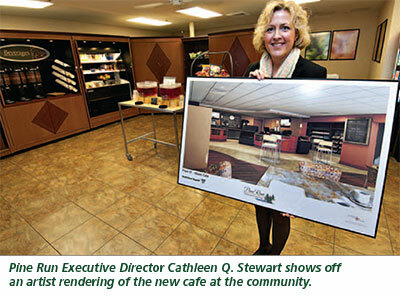 Cathleen Q. Stewart, Pine Run’s executive director, called the $11 million project the most significant renovation project of the 43-acre retirement community. From creating private rooms with full baths for all short-term patients and most long-term residents to a new bistro-style dining area available on each floor and a renovated central kitchen, the entire 37-year-old facility will get a facelift. “It will enhance the physical space and the quality of life for people who live and rehab here,” explained Stewart. The project includes large spaces for rehabilitative therapies and state-of-the art equipment. Patient safety will also be improved, said Stewart, with the latest technology to protect medication ordering and electronic medical records. A centralized, first-floor administration area will welcome patients and visitors, while also allowing for more patient-centered space on the upper floors. As baby boomers age and national health care reform takes shape, it’s important to have the care that Pine Run offers, said Carolyn Della-Rodolfa, chairwoman of Doylestown Hospital’s board of directors. 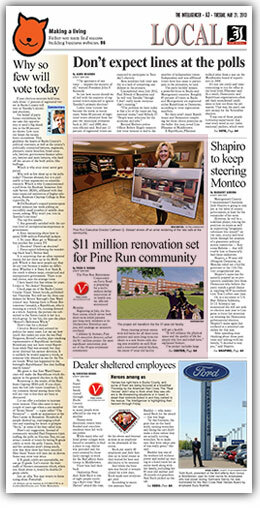 The hospital, which is run by the Village Improvement Association Health System, owns Pine Run. Pine Run has independent living, personal care residents and skilled nursing. It serves about 500 residents. “Guiding change takes careful consideration, and our aim is to ensure residents, patients and families that their care and privacy are paramount,” said Jim Brexler, chief executive officer of Doylestown Hospital. The project is expected to be completed in the spring of 2015. The health center will remain open during the renovation.